Bathroom remodeling is the most common home improvement project for homeowners. As many as 81% of all projects involve updating the bathroom. Frameless glass shower doors are trending as the modern way to enclose your shower. This glass minus the hardware will not only improve the look of your bathroom but is easier to care for too. Considering frameless glass for your shower? Consider these pros and cons before you make the decision. What are Frameless Glass Shower Doors? The goal of a frameless shower door is to embrace minimalism. You will see them and not realize that you have. There will be a distinct lack of hardware around the glass. Gone are the days of the gold and silver frames around the outside. Typically there are a few clips holding the sheet of glass in place. You’ll find that the glass in this system is much thicker than the framed option. There are many benefits of upgrading to frameless shower enclosures. Some are cosmetic, but there are also functional benefits. A minimalist interior design is trending right now. This trend has made frameless glass showers popular. 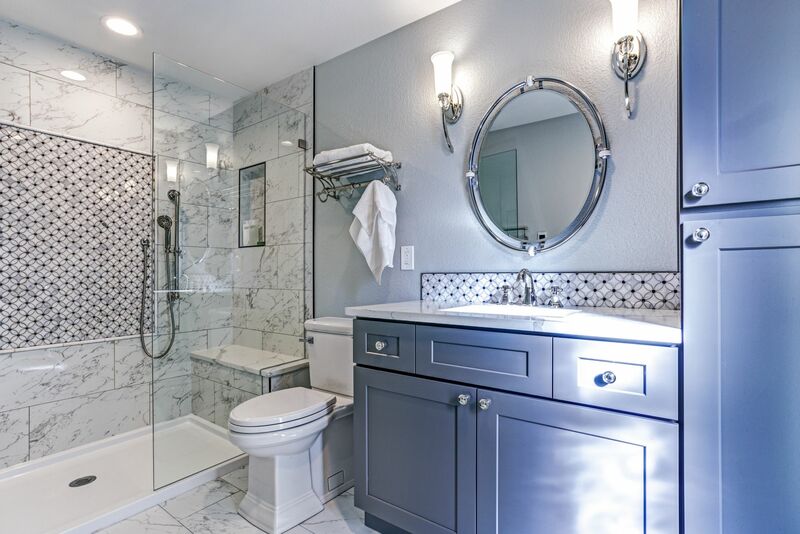 If you are looking to sell or rent your home, this will make the bathroom desirable. Having a frameless glass shower enclosure will be deemed as upscale. Once you eliminate the hardware, you are no longer limited to how you decorate the rest of the bathroom. This gives you complete freedom when decorating the rest of the bathroom. When you buy framed glass shower doors, you will find a standard set of sizes. Hopefully, your bathroom works with one of those sizes. Alternatively, you can cut frameless glass to fit whatever size you need. This gives the doors a lot more flexibility. Think of this as an opportunity to customize your shower doors. You can make them slide, or create any sized door. When there is no hardware, there is nothing to corrode. The corroded metal is the most common reason for replacement of traditional metal framed doors. Your shower will continue to look great long into the future. You will also save money by not having to make the replacement as soon. Sure, a frameless glass shower enclosure cannot magically add square footage to your bathroom. What it can do is trick your brain into thinking the bathroom is bigger. If you currently have a shower curtain, this is like a fabric wall dividing your bathroom. It makes the bathroom look smaller. A glass wall is transparent, so while it still divides the room, you don’t see it that way. Your bathroom will feel brighter, bigger, and airier. Mold will have fewer places to grow when there is no hardware for water to collect around. Framed shower doors give water the chance to collect under and around the door’s seals. This collected water and your bathroom’s warm temperature is the perfect environment for mold to grow. You are then fighting the never-ending battle to remove it. Frameless doors are the easiest to clean. Just wipe down the sheet of glass and squeegee. Once you’re done wiping, the glass is clear and you are clean. There are some cons to consider before making the commitment to a frameless glass door. Price tends to be the biggest deterrent to those looking to make the upgrade. The initial price of a frameless shower door is higher than that of traditional framed doors. If you are on a strict and tight budget, this may not be the door for you. However, you need to consider more than the initial investment. You are giving your home an upscale and modern update. You are also increasing the time of use before you need to replace this door. The money you spend on the glass now is well worth the benefits. The metal frame around traditional glass doors acts as an insulator. This keeps the water in the shower, and out of the rest of your bathroom. Without this insulation, water can leak out as you are bathing. Keep this in mind when considering the placement of your shower head. You won’t want the shower head pointing directly at the glass or gaps, as this may cause water to leak out. Have the glass cut to precise dimensions by a professional is the way to go in order to avoid this issue from even occuring. A professional will measure and cut the glass to fit your shower dimensions specifically and make the gaps as small as possible. This is a very rare occurrence. Frameless glass shower enclosures are made from tempered glass. On very rare occasions, the glass cannot withstand the heat from the water and the glass will shatter. This is a rare thing to happen and framed doors face the same potential problem. Do not let this very small possibility stop you from giving your shower a beautiful new look. Your bathroom and kitchen are the two places in your home that people notice the most. When remodeling your home for sale, these are the two rooms to do. Keep this in mind if you are thinking about giving your bathroom an update. You’ll want to pick features that give your home a modern and upscale feel. The best way to do that is by installing frameless glass shower doors in your shower. It’s like adding square footage without breaking down walls. Not sure where to start? Let us help you come up with a frameless shower design for your bathroom. It is good that you mentioned that the current trend right now when it comes to interior design is the use of frameless glass showers. Since my mother is thinking of the shower door that she can have as she's planning for a bathroom renovation, the use of the frameless shower glass might appeal to her. I will look for a sample to show that to her and convince her that is good and a trendy style at present. You make a great point that a frameless glass shower is very long lasting and easy to maintain because you don't have to worry about corrosion or mold growth. My husband and I dare planning to remodel our master bathroom and the fact that frameless doors will be so easy to clean and maintain would save us a lot of time. Plus, the fact that we can get the door custom-sized to our shower would give me peace of mind that it will fit perfectly in the bathroom. My wife and I want to get a new shower enclosure when we remodel this spring so thanks for sharing this. I like your point about how frameless shower doors don't corrode. Not having to worry about rust sounds like a great way to ensure it lasts a long time.